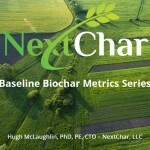 This article is the first in a series of white papers, Understanding Biochar. Pyrolysis transforms the vegetable portion of the starting biomass into a new solid form, chemically like graphite, but physically mostly open space or voids. Most importantly, the organic portion of the original biomass is converted into new molecular structures that have different properties compared to the starting biomass, including pronounced resistance to breakdown by biological processes in the soil. The mineral portion remains essentially the same, and is distributed wherever it was in the original biomass. The water leaves and there is rarely enough “animal” material to concern ourselves with, so combining these simultaneous changes gives us the essence of what happens when biomass is pyrolyzed into biochar.